The Glengarry News, February 13th, 1958, pg. 1 col. 5. Among the historic places of interest,and beauty in Glengarry, is the house built by Colonel Alexander Fraser, who commanded the Glengarry Militia during the rebellion of 1837 - 38, and which had much to do with its suppression. 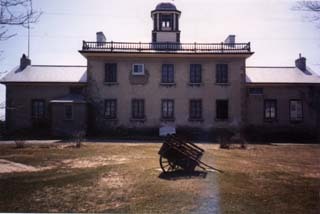 Col. Fraser belonged to a family that had come to Canada from Scotland and had settled in the Township of Charlottenburgh. While out in the war of 1812-14, he served as a Quartermaster in the Canadian Fencibles. When that period of hostilities was ended and it seemed safe to do so, Fraser settled on a very large farm at McGillivray's Bridge and built the house known as Fraserfield. It is a beautiful home and the house was built of hewn limestone which was transported from Kingston. Add to its beauty the historic interest and one understands why Fraserfield is so well known. The present owners of this outstanding landmark are Mr. and Mrs. Lucien Bougie, who have had a fine understanding of the history and architectural background of their home and while so far as modern comforts are concerned, the house is modern, all improvements have been carefully and well done. Mrs. Bougie has many times been a gracious hostess to the visitors who so often unexpectedly call. This is the fourth in a series prepared for the Glengarry News by Miss Llewella Dunlop of Williamstown.